Prolonged drought and increased water use in the southwest United States have led to shrinking reservoirs and the emergence of natural features that are affecting endangered species and river recreation. 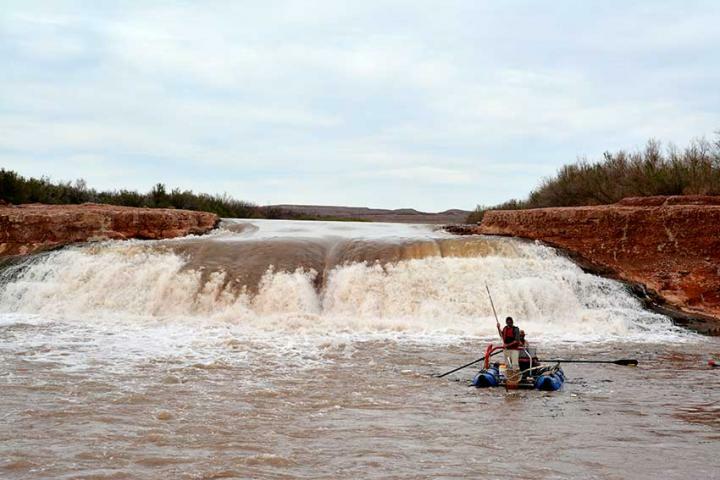 One feature, a waterfall known as the Piute Farms Waterfall, has formed in an area upstream of Lake Powell where the San Juan River serves as a border between the Navajo Nation to the south and Glen Canyon National Recreation Area to the north. Since the late 1980's, this waterfall formed from interactions among reservoir levels and sedimentation that redirected the San Juan River over a 20-foot high sandstone ledge. Until recently, little was known about its effect on two endangered fishes. "Even though we knew the waterfall existed for decades, nobody knew how it affected the Colorado pikeminnow and razorback sucker, two endangered species that are the focus of a large interdisciplinary recovery program," explained Dr. Mark McKinstry, a research biologist from the Bureau of Reclamation and one of the coauthors of the study. Since the inception of recovery programs in the Colorado River Basin in the early 1990's, endangered fishes have been tagged with "microchip" radio transmitters like those used to keep track of dogs, cats, and livestock. More recently, tag detection technology has allowed the construction of antennas that are small, portable, and submersible, thus allowing them to be used in places that were not feasible just a few years ago. "We know connectivity is important to fishes but these emergent river-reservoir processes could be further stressing populations," commented Casey Pennock, coauthor and graduate student at Kansas State University, "and its challenging researchers to better understand the resiliency of populations in systems that may never return to their historical conditions."